Doreen Nelson earned her Bachelor of Arts, Arts & Humanities and Elementary Teaching Credential in 1959 at UCLA where she was trained by progressive educators at the University Elementary School (U.E.S.) under the direction of Corinne E. Seeds. It was on the grounds of the U.E.S. where Nelson began to teach while interrogating and finding inspiration within John Dewey’s My Pedagogic Creed. In the late 1960s, Nelson began to experiment with the transformation of Dewey’s theories, while she developed and tested her pedagogy at Westminster Elementary School in the Oakwood neighborhood of Venice, California. It was during these incendiary times that Nelson figuratively lit the traditional one-room school house on fire with her progressive methodology called City Building Education. In 1974 she established the Center for City Building Education™ where she pioneered the educational methodology Backwards Thinking™ that reversed Dr. Benjamin Bloom’s taxonomy by starting the learning process with creative thinking. Today, Nelson continues to inspire and train teachers as Professor of Education and Adjunct Professor in the College of Environmental Design at California Polytechnic University in Pomona and Professor of Design-Based Learning at Art Center College of Design in Pasadena. This exhibit highlights Never-Before-Seen artifacts selected from Nelson’s archive that illustrate the power of progressive education for personal and political change. 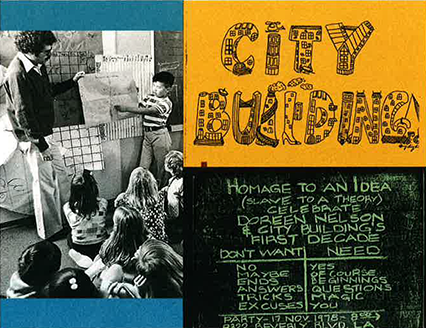 UCLA Library Special Collections is proud to steward and provide access to the Doreen Gehry Nelson Method of Design-Based Learning (formerly City Building Education™) Records to researchers interested in learning about Nelson’s teaching and methodology, which inspires hopeful imagination for future generations. This exhibit was co-curated by Kelly Besser, Processing Archivist and Genie Guerard, Curator/Manuscripts Librarian, with assistance from Octavio Olvera, Visual Arts Specialist. Kelly Besser processed the archive and conducted an oral history with Doreen Gehry Nelson. An excerpt from the oral history can be heard in the exhibit.